If you’re coming up on an important anniversary, what better way to celebrate than with a vows renewal ceremony? Private and intimate, the renewal of your vows is just between the two of you, a reminder of the time you met and all the years you have left together. It’s also a celebration of the years in between – years of building a family, building careers, and building lifelong memories. No wonder so many people choose a vows renewal ceremony as a way to celebrate a milestone anniversary! If you’re planning a vows renewal ceremony and are looking for locations, why not consider Wears Valley, TN? Beautifully situated at the foot of the Great Smoky Mountains, Wears Valley offers pastoral beauty surrounded by incredible mountain views. There are many Wears Valley cabins that are perfect for an intimate retreat such as yours. And Great Cabins in the Smokies has some of the best cabins of the Smoky Mountains. Take a look at Always and Forever, and you’ll find that it’s the perfect haven for your vows renewal ceremony. Always and Forever is a 1 BR, 1 BA studio cabin in Wears Valley. Located in between Pigeon Forge and Townsend, TN, it’s conveniently situated near all the places you may want to visit while you’re in the area, while still being private enough to provide a sanctuary for the two of you to celebrate your lives together. Warmly appointed, the wood interior creates a cozy space for two, just right for nestling in for a special respite. The king-sized log bed is comfortable and inviting. The gas fireplace in the corner adds to the ambiance. You’ll notice a hot tub on the screened porch. What a perfect way to heat things up! Open a bottle of wine and relax as you remind each other of why you got married in the first place. Vows are sacred, and renewing them at special times during your relationship is what keeps love alive. Take full advantage of your time in this Wears Valley cabin. In addition to the romance of this cozy cabin of the Smoky Mountains, it also offers modern-day amenities like a fully equipped kitchen, cable TV, Internet access, and shared swimming pool use (in season). This cabin overlooks a nearby pond. Sit on the deck and enjoy the views of the pond and the Wears Valley floor beyond as you plan your day’s activities. Of course, you may decide you’re happy where you are, and choose to not leave the cabin at all! Call or visit the Great Cabins in the Smokies website today to reserve Always and Forever for your vows renewal celebration vacation. 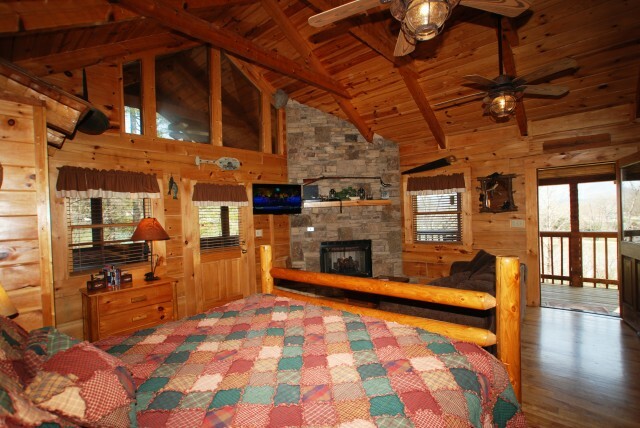 Or take a look at some of the other cabins of the Smoky Mountains we offer for rent. We’re always ready to help make your next vacation in the Smokies one to remember for years to come. Just like your special relationship!